Udderly EZ Cattle Cow Ultimate Machine Electric UEZ005 Livestock Milker. 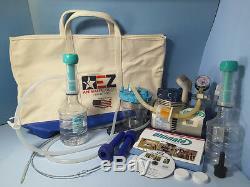 Udderly EZ Ultimate Machine Complete Kit OPERATING INSTRUCTIONS FOR THE ULTIMATE EZ MILKER 1. Unpack your Ultimate EZ vacuum pump and all accessories. Connect the blue colored tubing to the side of the top of the overfill jar lid. Make sure the lid and plug on top of plastic jar is tight. Connect the end of the white silicone tubing Y to the colored silicone tubing. Take bottle caps off and screw #2 extractor tubes onto bottles snuggly - not tight. Insert either the large or small set of silicone liners into the extractor tubes, making sure that they are seated securely into each tube. Make sure you use the correct size. Attach the two (2) white suction lines to the vacuum outlet on the side of each extractor tube. Switch is on the end of motor by power supply cord. Place both palms over top of silicone inserts on bottles to check and set Hg Vacuum. The regulator valve set is on the bottom of the pressure gauge. Apply olive oil sparingly to each teat. We recommend starting milking one (1) teat at a time first to help you become familiarized with the equipment. To operate just one bottle at a time, you may clamp off one of the bottles with the plastic clamp that is supplied on one of the silicone tubing lines. After you have acquainted yourself with the equipment, you may attach both bottles at the same time. (If you had clamped off one bottle, make sure you open the valve again). When you are finished milking, just tip the bottle slightly and pull off (see video). Unscrew bottles from extractor tubes and pour milk into pail or other container OR you may remove the silicone inserts and pour the milk into pail. If you choose to remove the insert and pour the milk through the extractor tube, make sure you have the tubing pointing UP on top of the extractor tube or it will aspirate milk into the catch bottle (see video). If this happens just dump out that milk. DO NOT USE THAT MILK! Clean out and replace the catch bottle, as that is a safety device to prevent milk from being drawn into the pump. Reconnect to the animal and finish milking, repeating above process until finished. DO NOT USE OUR GLASS BOTTLES ON THIS NEW MILKER! Always clean your bottles and silicone inserts after each milking, using dairy wash. If your pump is not pulling any vacuum, re-check all fittings and bottle seals and make sure that none of the bottles are clamped off. DO NOT operate this pump higher than the recommended setting for each species of animal. 11 Hg for Sheep and Goats and 12 ½ Hg for Cows. Before purchasing any items/product, please insure your country allows this product to be imported. Canceling an Order If you need to cancel an order or make changes, the request must be made within one hour of placing the order and confirmed by an E-Commerce Customer Service Representative. The following rules apply: · Products must be in original packaging and in a new and resalable condition. · Any product that was used or fully/partially installed is non-returnable. Excellent customer service and competitive pricing, is what you will receive when purchasing from Livestock Concepts. We supply a complete line of animal health supplies to livestock producers, veterinarians, pet and equine owners, as well as hobby farmers. We offer over 14,000 items for cattle, swine, sheep, goats horses, pets, birds and exotic animals. We market to 50 states as well as over 60 countries. We provide fast, friendly service, and cherish our customers. Clothing & Boots & Belts. The item "Udderly EZ Cattle Cow Ultimate Machine Electric UEZ005 Livestock Milker" is in sale since Saturday, January 26, 2019. This item is in the category "Business & Industrial\Agriculture & Forestry\Livestock Supplies\Dairy Cattle". The seller is "livestockconcepts" and is located in Hawarden, Iowa. This item can be shipped worldwide.